The cold-process method is the most common way to make soap from scratch. 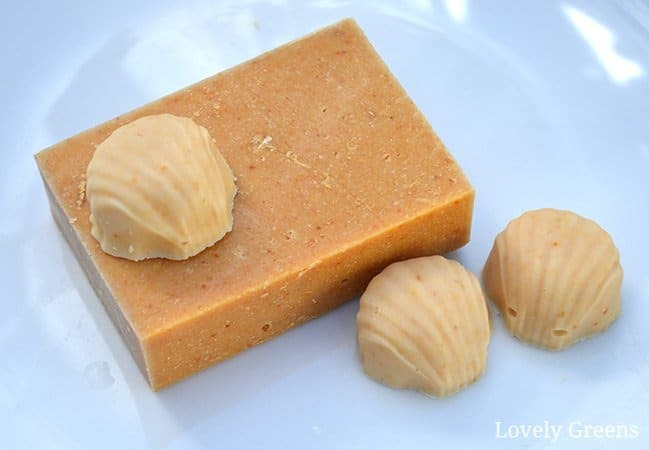 It’s easy enough for most anyone to try and you can make soap easily in your own kitchen. Though there’s usually some uncertainty in your first attempt, you’ll get the hang out of it by the second try. 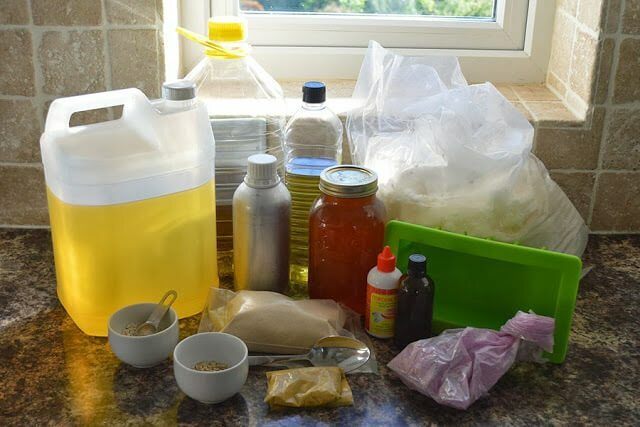 Soap making involves a lot of ingredients and steps so just try to keep organized. In case you’re wondering, cold-process does refer to temperature. It’s also in contrast with hot-process soap which as you can guess is a lot hotter and follows a different set of steps. More on temperature below. 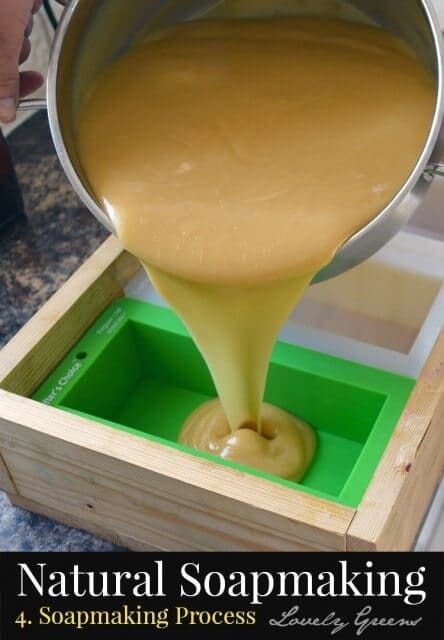 In this tutorial I’ll be showing you the steps I go through when making a honey soap. However, you can apply the instructions to practically any soap recipe, including the ones I provided in the last post. The video below shows how to make cold-process soap with this Lemongrass soap recipe. It helps to have everything you need prepared in advance. This includes measuring out ingredients and having your station set up. If there’s a moment of panic anywhere along the way then it definitely helps. Hurriedly measuring out ingredients or searching for an important piece of equipment can lead to mistakes. Take your time to read through the steps I’ve outlined and then set out everything you need. Even after many years of cold-process soap making I set up my stations every time. 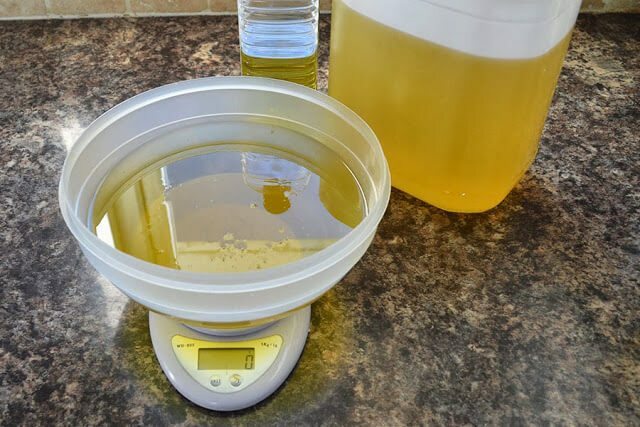 Measure all of your main liquid soap oils into a bowl. Not your essential oils though. My stations include my warming area where I’ll melt the oils. Nearby I have my digital thermometer, spoons, and a mini strainer and an immersion blender plugged into the wall. In another area I keep my bowl of liquid oils and additional measured ingredients. I measure all the liquid oils I’m using into the same bowl unless I’m setting aside one specifically as the ‘superfatting’ oil. My cooling area is my sink and this is where I’ll mix the lye and water solutions. Here I keep my stirring spoon at the ready and make sure to pop open the window for ventilation. In preparation for cooling my lye solution, I fill the sink with a couple inches of cold water. In another area I have my soap molds sitting out along with insulation materials such as towels and the wooden box I molds in. Lastly I use a kitchen scale to measure the solid oils into a stainless steel pan. Are you ready to start making soap? The first step is to begin melting the solid oils. Put the pan on the stove and turn it on to the lowest heat possible. Keep a close eye on it while you move to the next step. Stir the oils and break up any larger chunks to speed things up. Make sure to take it off the heat as soon as it’s completely melted. You could even take it off shortly before, since the residual heat will melt any small pieces of oil. Once your solid oils are on the hob turn your attention to your water (or other liquid) and lye. First make sure that your goggles and gloves are on and that the area you’re planning to work in is well ventilated – open a window if necessary. Please also ensure that any children and pets are out of the room so that you won’t be disturbed and that the likelihood of an accident is minimized. Now you’ll need to think of cooling methods. 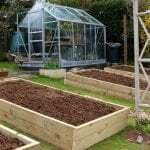 Once your lye and water have been combined the mixture will get very hot and will need to be cooled either in a basin of water or outdoors. Please don’t put it in the fridge since the solution gives off unhealthy fumes that you don’t want to come into contact with food. Though some people find it a bit scary, working with Sodium hydroxide (lye) is a necessary part of soap making from scratch. All soap is made using lye. 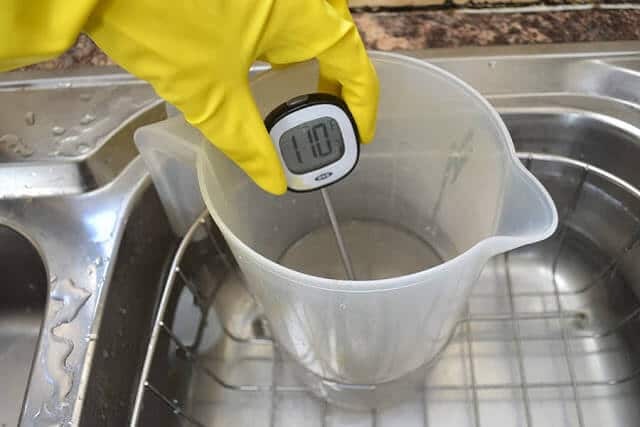 Measure your water and lye into two separate containers and for safety purposes, use containers made of glass, pyrex, or Polypropylene (PP) plastic. Take both containers to a ventilated area near your cooling station. Now slowly pour the lye into the water and stir with a stainless steel utensil. The chemical reaction between lye and water produces heat and steam so please be careful. A word of caution. Pouring the water into the lye since it can result in a volcano effect that can be startling. Always pour the lye into the water to avoid this scenario. Also of importance is to make sure that your water/liquid is at least at room temperature when you add the lye. This is especially important for those of you who are planning on making soap using a herbal infusion. The volcano in that situation can be dangerous. If your water is even lukewarm your lye solution can start to boil violently and even volcano out of your container. This volcano action can also happen if you have any ‘sugars’ such as honey or milk in your liquid. One of the most confusing parts about making soap for me was at what temperature do you mix the lye-solution and the oils? Do they have to be the same temperature? First of all, the temperature you mix your soap at will affect how your soap comes out in both color and texture. There are several factors that you’ll need to consider when choosing a soaping temperature and they’ll include batch size, type of mold, if sugars (honey, milk, sugar) are used, and what color you hope your batch will turn out. The hotter the temperature, the more intense the color your soap will be. Personally I make soap when the oils are between 90-120°F (32-49°C) and err on the cooler side if I’m using sugars. If you mix cold-process soap over 130°F (54°C) then you risk a whole host of issues including volcanoes, cracking, and discoloration. When I’m soaping I usually mix when the oils are between 90-120°F and the lye solution is within 10 degrees of the oil’s temperature but under 120°F. I will also sometimes work at room temperature when soap making. The only time I’ll ever make soap over 130°F is when I’m making soap that has beeswax in it. 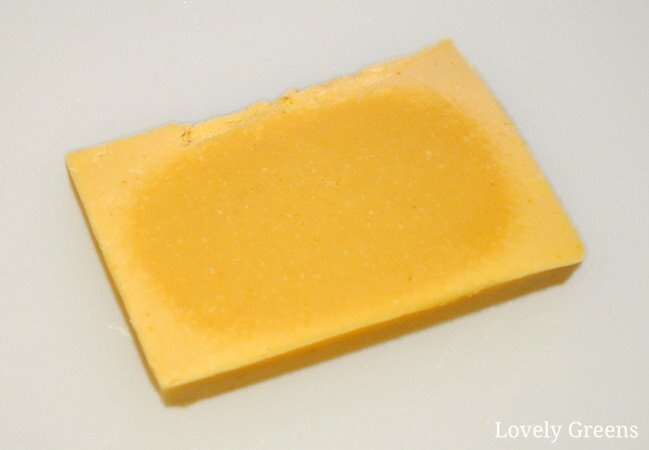 Beeswax has a melting point of 147°F (64°C) so it’s better to soap at around that temperature in that case. For larger batches that are going into large molds many soap makers tend to work with lower temperatures around or below 100°F. This is because of the tendency for large batches of soap in loaf molds to stay hotter in the center than on the outsides. This means that there’s a chance of a deeper color in the middle and lighter on the outside. Most soap makers that create large batches are doing so to sell them on to the public and a strangely colored bar of soap is less marketable than one with homogeneous color and texture. If you’re making a small batch of soap and want a medium intensity color then I’d recommend choosing a temperature closer to 110-120°F. If you’re making a small batch and would like a soft and opaque color then stick with lower temperatures of around 90-100°F. 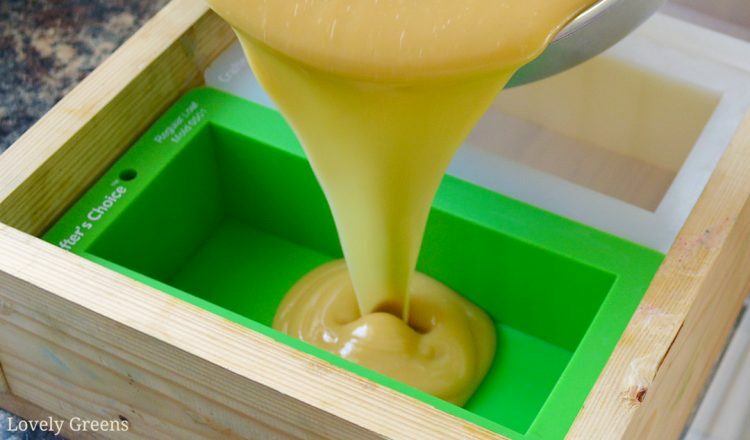 Having honey, milk, or sugar in your recipe will cause your soap batter to heat up. It will continue to heat up even after it’s been poured into molds. That’s why soap with ‘sugars’ in it can crack on the top if you’re not careful about temperatures. If you plan on using these ingredients then consider using lower temperatures. Temperatures above 110°F (43°C) can caramelize or burn the sugars resulting in a different smell and color than you were expecting. You can also use this to your advantage. The honey soap I’m making in the photos is honey-brown due to caramelization rather than the raw honey on its own. A higher mixing temperature will mean that the color of your soap will deepen dramatically due to a reaction called ‘Gelling’. If you’re after soft and light colored bars then use lower temperatures. Please also read the section below on insulation since this will affect the color of your soap too. Once your hard oils are fully melted, add your liquid oils and any additional colored oils and stir well. Check the temperatures of both the lye water and pot of oils. Adjust them until they’re within ten degrees of each other and close to your target mixing temperature. If the oils are too hot still, you can float the pan in the sink of water and stir it to cool. If they’re too cool, pop them on the heat again — they heat up quickly so keep an eye on them in that case. Lye that gets too cool can’t be warmed again. Some soap makers work with lye solutions that are room temperature while their oils are warm. As long as the overall temperature once you mix the lye solution and the oils is above the lowest melting point of your oils then you’re fine. Now comes the exciting part. Pour your lye-solution through a strainer and into your oils as shown above. The strainer is to make sure that no bits of undissolved lye make their way into your soap. Now submerge your immersion blender into the pan, giving it a little tap to release any air that might have been captured underneath. Start with a few short pulses and then stir. Repeat this until you come to ‘Trace’ – depending on your batch size it could take anywhere from 1-10 minutes. Trace is when the oils and lye-solution combine into soap through a process called saponification. You’ll know when your mixture has traced when its reached a thin pudding-like consistency. Once you lift your immersion blender out of the mix, you’ll also notice that you’ll be able to see little dribble of soap that lingers on the surface for a bit. Trace will continue thickening from a light batter consistency to thick and gloopy. Work quickly or sometimes it will firm up inside your pan. 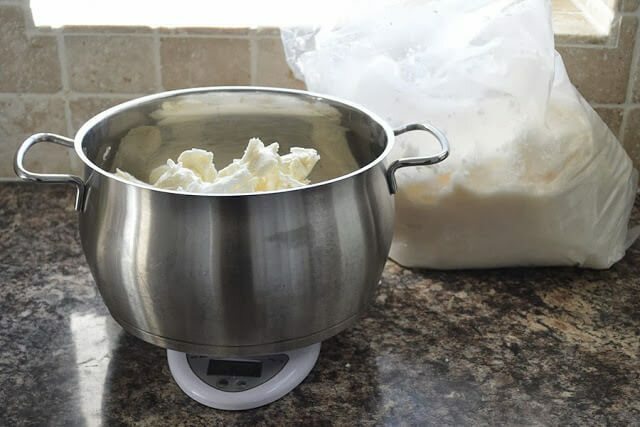 Once your soap has traced you’ll need to work quickly to add in some of the more delicate ingredients to your soap batter. These will include your superfatting oil, essential oils, and other extras. You add these after trace for a couple of reasons. Firstly, the chemical process of saponification (the oils combining with the lye-solution) can be very hot and adding fragile ingredients during that phase can destroy and evaporate their beneficial and fragrant properties. 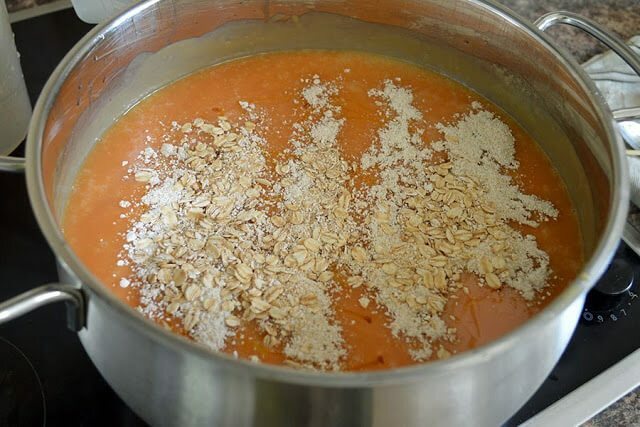 Secondly, if you add whole ingredients, such as rolled oats, before the soap has traced, then the immersion blender will pulse them up. The last reason specifically touches on the superfatting of your recipe. Most modern soap recipes include a superfat, meaning an extra amount of oil. The lye in a recipe can only convert a certain amount of oil into soap. If you add more than it needs it stays free-floating in the soap. This oil makes your soap more conditioning and less harsh on the skin. Most of my recipes do not include a superfat step. I have the superfat built into the main recipe so that your free-floating oils are a combination of all the oils you use. I find this way of superfatting easier for beginners since it doesn’t require an additional step. In the case that you have a fine oil that you’d like to act alone as a superfat it should be added at Trace. This gives it a better chance of surviving in your soap whole, rather than being converted into soap. An easy way to superfat is to add a liquid oil which you have measured and have set aside for this step. If you choose a hard oil, such as cocoa butter, you will need to melt it first before pouring it in. Personally, I’d recommend sticking with a liquid oil on your first few attempts. Part of this step is adding your antioxidant if you’re using it. Some soap makers use them and some think they’re unnecessary. The role of antioxidants is to help keep free-floating oils in your bars from going rancid over time. There are three main antioxidants that soap makers use: Grapefruit seed extract (GSE), Rosemary Oleoresin Extract (ROE), and Vitamin E, and each has their own pros and cons. Read up on them and choose which one will be best for you. I should also say that antioxidants are not true preservatives but work to keep the extra oils in your soap from going rancid. Soap does not require a preservative since once it’s ready to use, it does not contain any water or environment where bacteria can thrive. Note: Try to work as quickly as you can in this step since depending on your recipe, your soap may start to set (harden up). Also, I’ve found that using a whisk is the best way to incorporate your extra ingredients. However, try not to beat the soap or introduce air into the mix or you can end up with air bubbles in your soap. Your soap is now ready to be poured into your molds. Please have a look at the equipment post for more information on what you can use. For most of my soap I use silicone loaf molds that hold 6-8 bars at a time. This one is my favorite. There are plenty of other types of molds out there though and quite a few household hacks though. 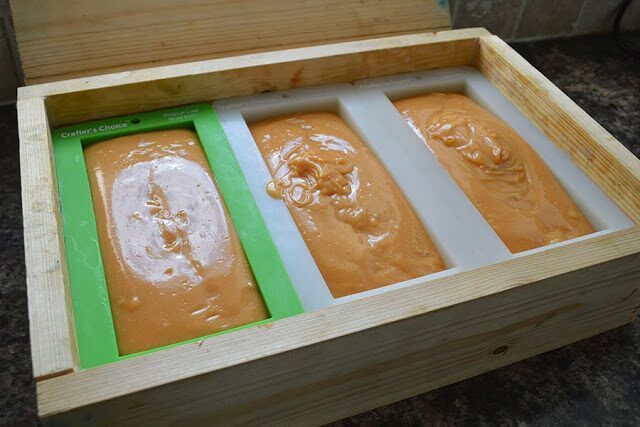 Lift and plunk your molds down a couple of times after the soap has been poured in to help settle out the mix and release any trapped air bubbles. Now you’ll have a choice on whether you’d like to insulate your soap or not. Insulating it will keep the temperature warm and steady over the next day or so. Keeping it warm will deepen the color and add a slight transparency to the finished bars — this is called putting the soap through the ‘Gel State’. You can insulate your soap in a wooden box as I do, or line the top of the soap with cling film and wrap a big fluffy towel around the mold. If you choose not to insulate your soap then the color will be much lighter and opaque. You can even ensure that your soap doesn’t gel by putting it in the fridge after you’ve poured it in the mold. The center of this soap gelled while the outer edges did not. That’s why it’s darker in the middle. If you do not insulate your loaf molds there’s a chance that the inner part of the loaf will ‘gel’ and the outer parts will not. You’ll see this as a darker circle on the inside of your cut soap bars. It will not affect the soap’s usefulness but can look unattractive. If you use sugars in your recipe it’s likely that you will not need to insulate your soap. Sugars will raise the temperature of your soap even after it’s been poured into the molds and further insulation can cause your soap to volcano or darken to an undesired color. You need to let the soap sit for at least twenty-four hours before you unmold it. This allows for the soap to set and cool down to room temperature and if you try to take your soap out before this time then you can be left with a sticky mess. I actually recommend waiting a full 48 hours before unmolding. That way, saponification is pretty much complete and the soap is safer to handle. If you’ve used small bar-sized molds you can pop your soap out and set them on shelves to cure right away. Those using non-silicone plastic molds may encounter some issues in getting the soap out and to you I’d recommend popping the molds into the freezer for around thirty minutes. The soap should pop out like an ice cube afterwards. I have a lot more information on soap molds over here. With loaves, just use a sharp knife to cut your soap block into bars. If you want exact sized bars then invest in a professional soap cutter. Some are relatively inexpensive and good for the small producer. A hack would be to use a mitre box and a knife that will fit through one of the sets of vertical slats. Your soap looks finished and might even smell pretty nice at this point but it’s not ready yet. First you’ll need to set the bars in a cool and well ventilated area, out of direct sunlight. 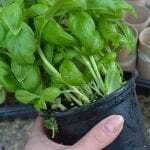 Space them out to increase air flow, and leave them to dry for at least four weeks. This period is called ‘curing’ and it gives time for the soap to finish saponification. It’s also to give them time to dry and for the water to evaporate out of your bars. Just try to forget about the soap and move on to other projects for awhile. Before you know it, the time will have passed and they’ll be ready to use. For full instructions on curing soap, and ways to speed up the process, head over here. Hopefully this tutorial has been helpful. If you have any questions please feel free to leave them in the comments section. There’s also a lot of information in the other three posts of this series so have a browse through them too. Interesting read – thanks. I might give it a try over the summer (when I have some time). Maybe make some for Christmas! Hi Tanya! I love your blogs and I want to start my own soap making journey. I have a few questions though, a local store here is selling “handmade soap with baking soda” for skin whitening and cleansing benefits, have you tried adding baking soda to your soaps? will it cause a chemical reaction? which part of the process should you add it? Hi Kim — baking soda in soap would be scratchy and would not whiten the skin. Instead it disrupts your skin’s natural acid mantle and along with soaps cleansing of oil, it could cause skin irritation. I’d avoid that soap. Hi, whn we add vegetables r fruit puree,should we keep d soap in fridge until it sets? There’s no need to refrigerate soap because of added fruit puree. It won’t spoil if you’re using the correct amount. What soap does need is plenty of air during the curing process to allow the water in your recipe to evaporate out. Hey Tanya , thank you so much for all these usefull and very clear informations! i just started Diy soap making nearly one year ago and your tips helped me a lot!! I’m also looking forward to start a business as i love to make it ! after the curing process, where do you store the soaps? and how long can a soap last before all the fragrances are lost? I use only pure or organic essential oils. For the moment i store them on the same shelf as my curing soaps. some are stored in a closed cardboard box but all together. i red on internet that some were using rubbermaid box with one scent / box….And as i live in Cambodia, with a tropical climate,i have no cool place, so the best place i can get is in my corridor, wich is shady, and ventilated wether by fan or draught. i’m also concerned about learning some basics about skin types. some friends asked me “for my skin what soap would you suggest me?”..Well, i have no answer…haha… or “be carefull with essential oils, some are allergic, pregnant women and kids are more sensitive”…. how can i know which essential oils to use/avoid in these particular cases? Some have to be avoid if applied directly on the skin. what about if it’s not more than 2-3% in a recipe? i would really like to learn more about skin, the use of essentials oils an its restrictions in cosmetics…i feel stuck lol. do you have any advices, tips, or informations to share about it? Do you have any suggestions about how to start a business in this field, what i need to know about legislations and further for labelling? Hi Siu! I use plastic bins to store my soaps in and it’s one scent per box. Storing them together can affect the scent. Yes I seal the lid. The shelf-life of your soap can be up to two years but is completely dependent on the expiration date of the exact bottle/box of oils you use. Look for the closest best by date and that’s how long your soap will be certain to be good by. 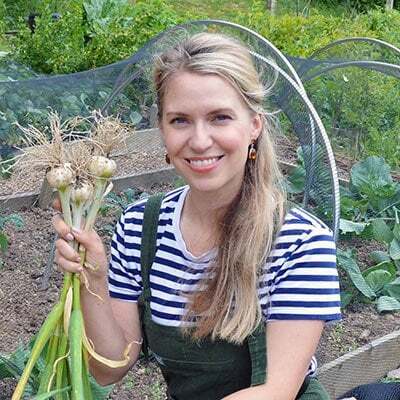 Thank you Tanya, the list you shared is so helpful there are some i passed by all the time in the market but now i Know, so what are some of the natural fragrances that remains even after the curing process u would suggest? i have been using eucalyptus and it stays but i want to change to others, i guess imma keep reading your reviews for more clarifications, i am definately into natural soap making. hey Tanya i am a new soap maker from Rwanda , i’ve read so many soap reviews but yours ranks them it is so crystal clear, i do have a question tho ,so could botanicals like dried rose flowers, dried lavender flowers and chamomile be used as fragrances and colors? As for scent, unfortunately you won’t get very much from using dried plant material direct in soap. It’s more for decoration. 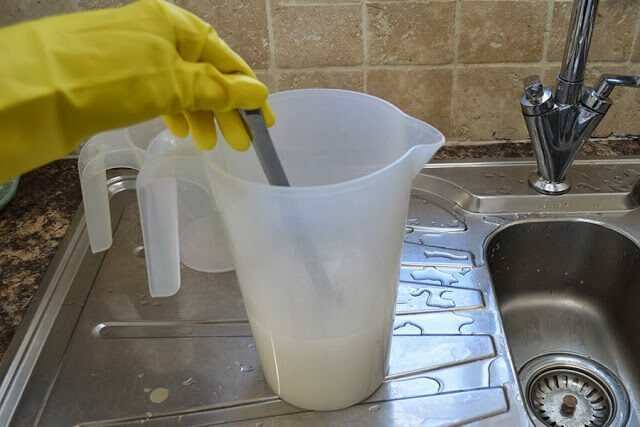 In my experience, the best way to avoid soda ash is to use a water discount. Whatever the recipe gives you for the Sodium hydroxide amount (in weight — grams, oz), multiply that by 1.8 to get a new water amount for the recipe. This is the ratio that I use regularly. Absolutely! That’s exactly what I’ll do — make more soap! 2. Despite no superfatting, if I try to do my dishes with it, it leaves an oily residue. What should I change to get squeaky clean, non-oily dishes? Also, if I add essential oils, when I cure the soap in a well-ventilated area for a month, won’t the smell go away? Oops, please ignore the question about the essential oils — I read your part 1 again! Yes you’re completely fine with using your grey water (from doing your dishes) to water your outdoor plants. I probably wouldn’t try it with house plants though since I imagine the soap would accumulate in the soil. I’m not 100% sure about it though but my gut feeling says no. Also, a soap with zero superfat should not leave any residue on dishes. What recipe and process did you use? I used 6 oz. coconut oil, 5 oz. palm oil and 5 oz. sunflower oil. And 2.5 oz. lye. Cold process. Perhaps it’s possible that the soap still is too fresh? I made it just five days ago, and I have been using the flakes left in my mould — it might ‘improve’ in 4-6 weeks? Anyway, in the worst case, I’ll probably grate it and use it as a laundry soap! Yes, good point — about not using the grey water in indoor plants or those with limited soil. Hi Nandita. It makes sense now — your recipe is good but you need to let cold-process soap cure for at least four weeks before using it. Technically saponification is supposed to finish 48 hours after you make soap but it could take more time. It could smell, look, and act different to what the end product will be at the end of the cure time. Be patient, give it time, and come back to it in another 23 days. Thanks; I will. Sigh, a watched soap is long in curing! 🙂 And I love to keep going back and smelling it — that *pure* soap smell — I’ll probably keep mine unscented! Thanks once again — I really like your site. And I realised that there is so much info to digest that I should go through each of the four parts at least 3-4 times to absorb all that you are saying! The best way to forget about your soap while it’s curing is to make more soap! 😀 If you have any further questions just let me know. Thanks a million. You are a darling. Ihave read so many posts regarding soaps but by far yours isthe best. Very nice recipe and love your tips, thanks Taniya! 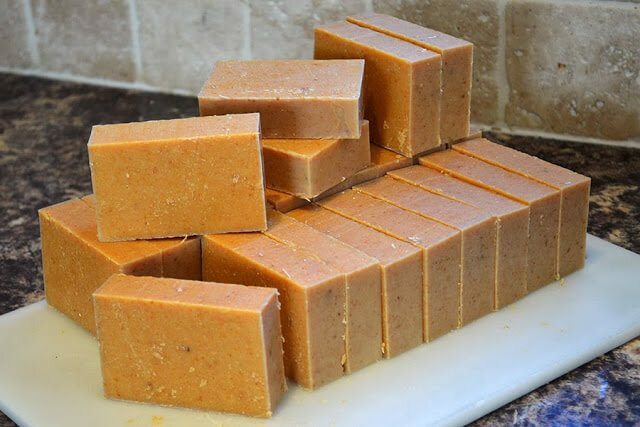 Hi Tanya, I’m new to soap making and even though I am very keen to make bars for personal care, I am also interested in making a laundry soap from scratch. Any advice on how to go about it or maybe a link? Thanks for all the great info and guidance! I’m from Pretoria, South Africa. 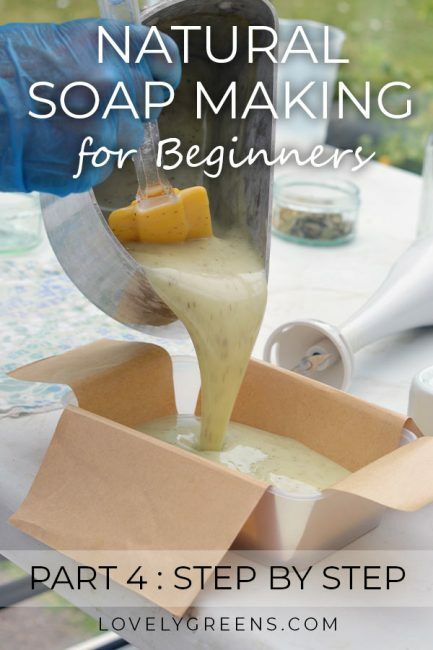 Hi Marianne and welcome to soapmaking! A simple DIY laundry detergent includes a bar of soap grated with a cheese grater and one cup of Washing Soda. Use 1/5 Tbsp per load. Hope this helps. I have just stumbled again your posts/website via a link on Pinterest. Making soap, from scratch is something I have been interested in doing for yeeeears. I’ve never quite had the confidence to actually try. Your posts are so thorough, I am already making lists in my head. ? Thank you for sharing this wealth of information. This is one of the best tutorials I have read so far. I’m just about to start venturing into the soap making world and these posts helped clear up a lot of questions I still had. Also is there a huge difference between extra virgin olive oil and the pomace olive oil? Hi, Tanya! Thank you so very much for writing this series! I have studied it and have made three batches of soap! The only part I have trouble with is matching the soap lye temperature. I know you said it is not complicated, I just have to master the process! I am getting my oil too hot in the first place. I am going to get two thermometers so I can keep a closer eye on the temps. Thank you again for writing this! I very much appreciate it! Got your message over on Facebook too! M&P you can use right away. Hi Tanya, I follow you on Instagram, but wasn’t aware of the blog until I recently started to research soap making. I am really interested in making herbal soap and salves. Specifically a poison ivy soap recipe for the gardeners and friends who I am always making up batches of jewelweed and plantain in a witch hazel base. You can never have enough of this stuff on hand it seems so soapmaking would be a great option. Thank you for the articles, they lowered the stress factor for me. I have family members who are vegan, so am interested in options besides palm oil. Just saw the Orangatang who signs video (sigh). Hi Carolyn! There are many recipes that don’t use Palm oil or which specifically use Sustainably Sourced Palm. The top three main oils for a non-palm recipe would likely be olive oil, coconut oil, and sunflower oil. For my first soap I was hoping to do a fairly simple recipe. I tried using the calculator and I wanted to verify that my recipe will work. Please advise? Hi Vanessa! Your recipe is probably not going to give you a good batch of soap. You need to add some conditioning oils like sunflower or olive oil (as the main oil I recommend). Tip: When you enter your values into the soap calc press the button to ‘2. View or print recipe’. There’s a box in the bottom left called Soap Bar Quality with ranges for each value provided – your own numbers do not fit into any of the ranges. I recommend you start with an existing soap recipe such as the ones I’ve provided and then tweak it in the soap calc. Good luck! I’m just in the process of learning how to make soap, this was a most useful post, I will regularly be referring back to it. Great work. 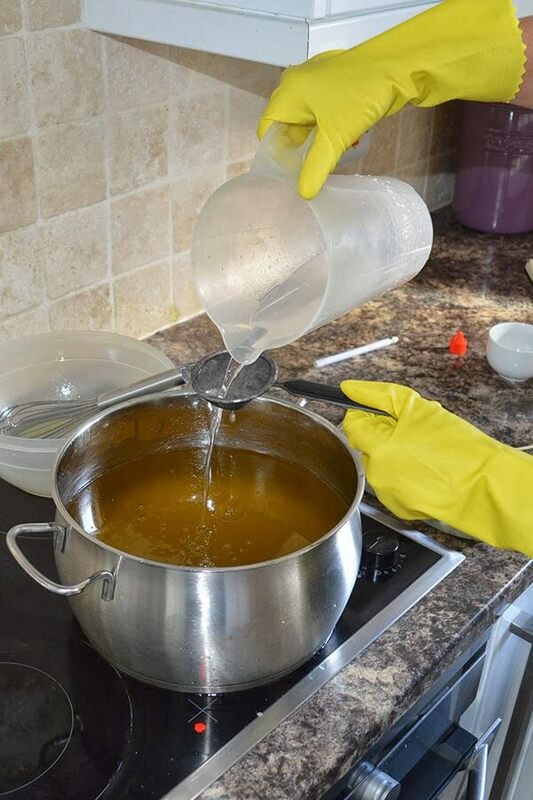 Thank you very much for giving such an informative post on soap making! I have made a few soaps in the past but am keen to master the process and use all natural ingredients that are safe for the whole family. It will be hard to wait a month for them to be ready but Im sure it will be worth it. I have a lot of respect and appreciation for your time and effort on this post! I’m a fairly new soap maker but I’ve done a lot of research online, with books and also join a few groups on fb, you are straightforward, very informative while keeping it simple, I wish lots of blessings on you for sharing all the knowledge you have. Have you ever done the Hot process method? That is all I’ve done because I’m impatient but I am ready to give the CP a try. Thanks so much for the information. Thank you so much for this kind message Lilly! I have tried Hot Process but the rustic look of the soap afterwards isn’t my favourite so I mainly stick with CP. Trust me, once you make a few batches and then stash them away, a month to wait is over in the blink of an eye. Thank you for the detailed explanation of making soap. Currently i am in indonesia where the wheather is humid. Hot but very moisty. So my question is after finishing uo my soap and i am in the patiance period where i wait and see the turn out..so fan and coring it up with a towel couldbe good to this period or should i just let it uncovered in a room? In a hot Indonesian room it shouldn’t need any insulating towels – there’s a chance the soap could overhead and have a volcano effect out of the mould. If I were you, I’d experiment with simply leaving the moulds on a tabletop as you suggest. hi Tanya thank you so much for this extensive and informative tutorial. I am ready to start now. Wish me luck! I hope the bars are finished before Christmas! I am prepared for the worst! But I’m hoping for the best. I love following you on FB and reading Lovely Greens blog. I’ve got the rest of my life to spend following some of these home made recipes. It’s what I’ve always wished to do! So lovely to hear from you here and on my Facebook page Pia 🙂 It sounds like your heart shaped soaps will be a hit this Christmas! Awesome advice and step by step tutorial! Super stoked to start making my own soaps! I do have just one question- I’d rather ask this one than chance it.. When exactly do you add honey or sugars, or milks (if those ingredients are in fact in your recipe)? Thank you so much and thanks again for sharing your tips and tricks! That would make a good blog post in itself! It’s all different Chelsea and depending on what you want to do with the sugars. If you add a little in before saponification then you can achieve a lovely natural golden colour to your bars. If you want the bars to be unaffected (colour-wise) by the sugar you need to be far more careful. Making goats milk soap often including freezing the milk before use. This was the best information I have found yet. I will try your recipes. Wish I had found this before I spent a fortune on oils, FO, etc. Oh well ! I don’t mind that much. This soap making process is helping me getting through a ruff spot in my life so… it’s all worth it. I love making soap and learning. I will share your blog with friends., Thank you so much for all of this information 🙂 God bless you . Hi Tanya. First of all, thank you so much for this tutorial. I made my first batch of cold process soap tonight, and am eager to see how it will turn out. I had a couple of questions re: superfat that I would really grateful if you could help me with. In your tutorial, you say to add whichever oil/butter you want as superfat after trace. I chose cocoa butter to add at this point. My first question is re: SoapCalc. Should I enter the cocoa butter in the oils section, along with olive oil, coconut oil etc? Or do I just calculate how many grams 5% is? Secondly, I have been told that you cannot choose your superfat when making cold process soap as the lye chooses which oils it will saponify and which it will leave to superfat. Can you clarify your thoughts on this please? Thank you again! Hi Sarah and happy soapmaking! I hope your first batch turns out well but if you run into issues (like I did on my first THREE batches) just keep at it. SoapCalc calculates the Superfatting in a recipe by looking at the oil amounts you input and by changing the amount of lye required for the recipe. The higher the percentage of your superfatting option, the lower the amount of lye needed. So basically, any five percent of your oils added after trace will have the best chance of surviving saponification. Choosing oils for Superfatting: The term ‘Trace’ means that most of your oils have bonded with the lye and are on their way to becoming soap! If you add your oils after Trace, there will be a lot less chance of it finding lye and a much higher chance of it staying in your bars as oil. There are also some oils that don’t bond with lye as easily as others (Shea Butter for example) so even if you add it before Trace it’s likely to remain more of a superfatting oil. I am a little confused on one thing so I do apologise. When you add a superfatting oil or any of the other extras after the process off mixing lye water and oils together. Do I include their measurements in the original ingredient amount but do not add until the end? That's right Emmelina! In the Soap Calc ( http://soapcalc.net/calc/SoapCalcWP.asp ) you can change the amount Superfatting percentage and all the oils you need for the recipe will be calculated for you. Just reserve approximately the same percentage of oils from your finest oils (the ones you want to be free-floating in the soap bars) for the end. I'm always wanted to try my hand at cold process soap making. Your tutorial is by far the best I've seen and I'm feeling empowered. Thank you. Thanks so much and happy soaping! My wife and I make cold process lye soap every Fall. Thank you so much for publishing this excellent tutorial! I have made lots of batches of soap. Your tutorials have answered many of my questions. I am looking forward to make my next batch and adding cornstarch and GSE to it. 🙂 I"m also looking forward to experimenting with natural colorants and using botanicals. One botanical we have added for exfoliant that I didn't see mentioned, was used coffee grounds. It adds exfoliant and color. It makes for a great hand cleaning soap and invigorating shower bar. I am hesitant to make soap from scratch using lye, however I am looking for an alternative to the harsh chemicals in store bought soaps. what is your opinion on the ingredients in the melt-and-pour pre-made soaps? are they more natural or just as bad as the store bought soaps? thank you so much! It depends on the Melt-and-Pour really – I personally don’t see any issues with using it as long as it’s SLS and SLES-free. These chemicals are often used in ‘Soap’ to boost bubbles and lather or just as a surfactant. Thanks for the awesome information! I was wondering if I could use lard instead of the tallow fat because it seems easier to find in my area. Thanks so much for your help. Sharing of your time, advice and knowledge is truly commendable! Hi Tracy, we used your Herbal Soap Recipe for our first attempt. After about 36 hours we tried to cut into it, and it is squishy and sticks to the knife. What did we do wrong? Did we not mix it with the stick blender for long enough? Thank you!! I meant Tanya, sorry. 😛 I just woke up. Hi Sam – I've just replied to your email regarding this. Please check your ingredient measurements and try again. It could be that you didn't allow the soap to trace properly but my guess is that you may have added too much water to the recipe. Thank you so much. Maybe I missed something, but how did you calculate how much oil you used to superfat at trace? Do you calculate the 5% on the total recipe weight or on just what oils/butters are in the recipe. Thank you so much for your help. Just on the oils used in the recipe Christy. Thank you for this great tutorial. I have switched to all natural beauty products and foods for 2014 so I wanted to try making my own soaps. I have been doing research for the last few months on soap making. Your site is the best. Thanks again! Your directions are excellent, thank you! A friend wanted me to talk her through this via phone as she doesn't live near me. It was great to be able to send her to you, so thank you! Have you ever tried using herbal tea instead of water as you make the soap? It may sound a bit odd, but it gives a lovely product. I brew a strong batch of tea and it works just like it does with water. My favorite is Celestial Seasonings Tension Tamer tea (double strength) in a soap that I add powdered oatmeal, cinnamon essential oil and either rosewood or sandalwood oil. It gives it a dimension that the same recipe just doesn't have when plain water is used. I have also used Tazo Wild Sweet Orange tea in a batch that I added lemon, orange and cinnamon essential oils to. Thank you so much for this Tutorial. I was going to give up on soap making… my first batch didn't turn out so well. It suds for a while then it stops. I was starting off simple by buying ingredients from HL but I will try your method. The post on soap-making is extremely helpful and detailed. I've been making soaps recently, but the problem is despite adding essential oils, the soap doesn't smell that great. Could it be because i'm adding the essential oil too early? Do i need to wait for the soap temperature to lessen before adding EO? Would be really helpful if you can tell. Thanks. Hi Scinia and yes, it could be that you're adding the essential oils when the soap is too hot. Essential oils are quite delicate and can evaporate in batches that are too hot – especially citrus based essential oils. Try adding them as the very last ingredient and see if that works? Also, I'd try mixing your lye-water and oils at a lower temperature too – 95-100F perhaps? Tanya, thank you so much for this detailed tutorial. I recently took a small soap-making class where we made our own batch of soap to take home, and plan to try my hand at making it myself. Your instructions are so thorough and easy to understand, I will definitely be referring to them closely when I try it. Bless you! The procedure you have shared about making soap is nice. Some soap contains triclosan as their main ingredient. We need to choose triclosan free soap because they do not harm our skin. I have access to 50% NaOH. How do I calculate your lye to water concentration vs. using the caustic solution? I've made soap before with lye but want to try the liquid caustic next. Thanks for your great tutorials! Hi there! I'd be very careful using NaOH dilutions…do you know what is in the other half? Very generous of you to share your knowledge and expertise, Tanya. I doubt I'll be making soap at any time soon (no space for the equipment or time) but it really underlines the hard work and attention that goes into every bar that you make. Awesome! Thanks so much Caro 🙂 I've had quite a few people ask me about how soap was made so thought this would be a good opportunity to show the process. I'm also going to be offering soap making courses from next year and setting down some information seemed the best step in that direction. 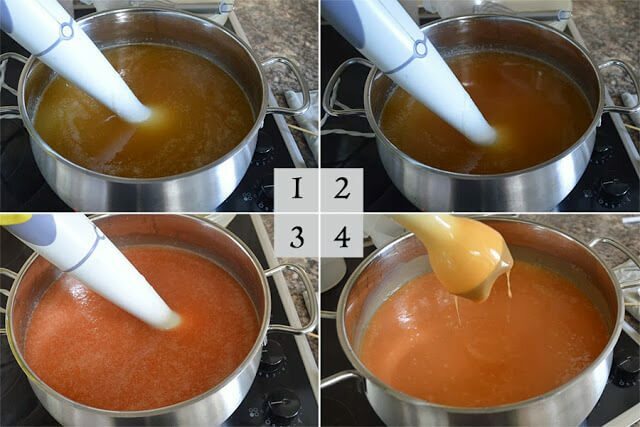 Looks like caramel to me in the top pictures especially. Good enough to eat! Melt and pour is perfect for the home crafter who isn't as keen to work with lye. It's also a great way to introduce kids to making soap since it's so safe. I haven't made soap yet but I think that I can do it now that you have posted this series that even I can go with. I am collecting fat still. I can probably get some from some people who are butchering hogs, they usually have a lot. 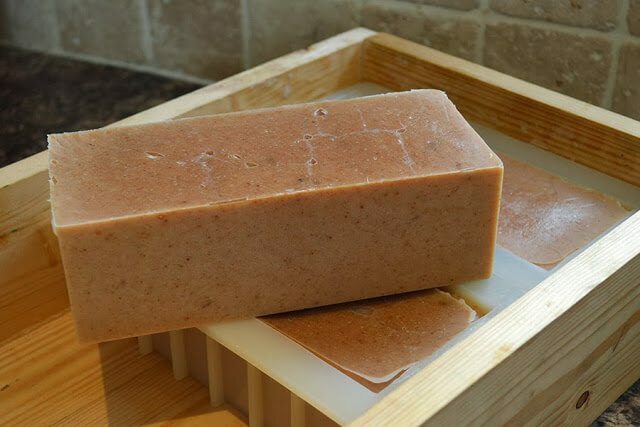 Pork fat (lard) is a really good fat to use in soapmaking – as long as you're not a vegetarian of course! While it's not great to use as a sole oil, using some of it in your recipe will add conditioning and a creamy texture. I've never rendered down port fat before Sunnybrook but would be interested to hear how you get on if you manage to get some from your hog contacts! Tanya – Thank you so much for the information you have so willingly shared with us – bless you. I have been making a soap which uses a lye solution, coconut oil, pomace and canola oil – and an essential oil mixed in at the end. I let the temperature reach 50oC (120oF) before mixing the lye and oils together. Merry Christmas Tanya – and all the best for 2014.